The Rotterdam Arts & Sciences Lab (RASL) has launched the hybrid publication platform RASL Compositions. Imagining Alternative Futures. 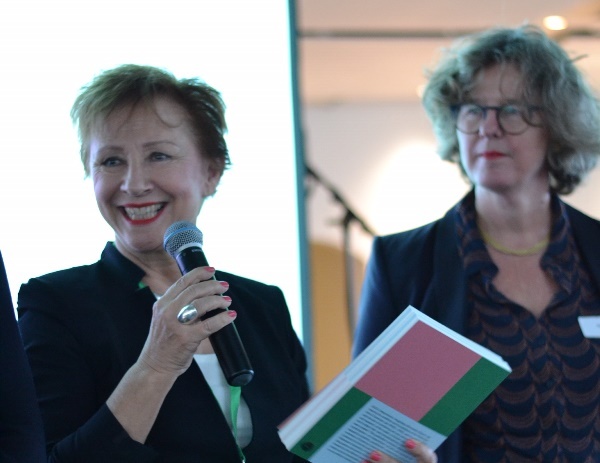 Codarts’ president of the Executive Board Wilma Franchimon presented the first printed copy to Babs van den Bergh (director The Association of Universities in the Netherlands) and Carola Hageman (deputy director and secretary of The Netherlands Association of Universities of Applied Sciences) at the RASL symposium on Wednesday 21 November. Through this hybrid publishing platform, RASL aspires to build a network in which various encounters, conversations and collaborations between the arts and sciences can take place. To be able to create such an environment and foster new perspectives, we need publishing platforms that allow us to present artistic-scientific projects and research that cannot be contained in traditional formats characterised by a logics of either/or: either purely academic or purely artistic; purely digital or analogue; on screen or in print. RASL believes that our way of publishing should be aligned with the innovative spirit of RASL and actively partake in the project of facilitating previously unimaginable encounters. One way in which we aim to do this is through challenging traditional ways of disseminating knowledge. Our open-source publication generator allows you to select any article from the library and create your own personalised publication.